At the turn of the 18th century, British companies began to make toys that are still favorites today: toy soldiers, farmyards, wooden building blocks, steam engines, and kaleidoscopes. The toymaking industry began to boom, making mass-produced toys cheap enough to afford. By the start of the Regency Period, people had become accustomed to purchasing them and they became educational in nature as well, such as puzzles. 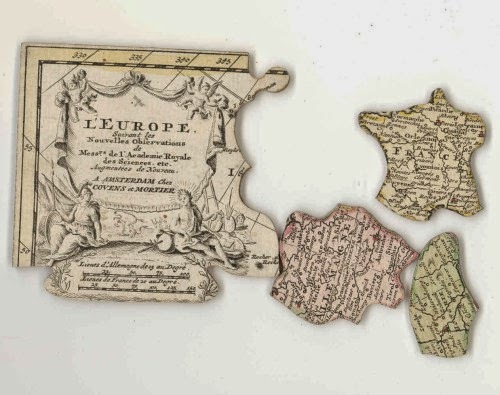 Many sources claim that John Spilsbury, a teacher in England, created the first jigsaw puzzle in 1767. He glued a map of England and Wales to a flat thin piece of mahogany board and used a fine saw (fretsaw) to cut along the borders of the counties, which made up the separate pieces. The “dissected map” became instantly successful. Early puzzles did not come with an image that helped people to solve them, and a careless movement could ruin hours of painstaking work.